LED stands for light-emitting diode and explains a basic diode that emits light when activated. The diode is placed inside the ear plug and will appear luminous after a touch of the back button. The diode is driven by a lithium button cell battery. Six different colours ranging from blue to red give you several options to choose from. Sizes vary from 8mm to 26mm in diameter. Even switched off these ear plugs make a subtle and noble impression. The whitely flat acrylic surface can be combined to any fashion style and worn at any occasion. All LED plugs include a charged battery when shipped. In case you need new batteries, Flesh Tunnel Shop can provide you with these. Although flesh tunnels and ear plugs are anyway a very special ear jewelry they have become more and more popular within the last years. This makes it harder to find some cool tunnel jewelry that is so different that it makes you really stand out. We update our jewelry portfolio on a regular basis to always offer you the latest tunnel trends and most individual tunnel plugs. Although LED tunnels are not a completely new invention they are still a real treat. They shine in the dark very brightly and will make you stand out at any party, festival or concert. Although piercing fans often call them LED Tunnels they are basically flesh plugs because there is no hole in the center of the jewelry. The LED plugs are filled with a so called electroluminescent diode which makes them shine in the dark. It just needs little power which makes the batteries last very long. You can also switch the light off at any time and the LED plugs will still look very beautiful even without beeing lighted up. In our LED tunnel shop we offer a large variety of different colours of different LED ear plugs. This helps you to always find a colour that will perfectly fit to your clothing style. Our Ear Plugs with LED are available in blue, green, purple, pink, red, white and multi colour. While all one-coloured flesh plugs will illuminate in the colour of your choice the so called colour change plugs will take turns between the colours blue, green, purple, pink, red, white. This way you don´t even have to decide for a colour but you can take them all. 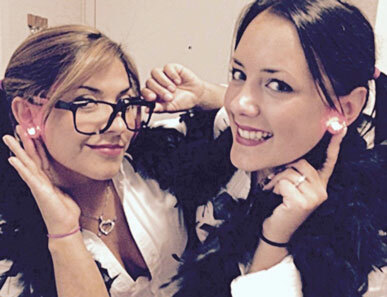 :-) Our LED plugs are available for smaller and larger earlobe piercing sizes ranging from 8mm to 26 millimeters. This way almost anybody will find his or her LED tunnel size.